You think you’re ready. You’ve doubled your cloud infrastructure. You’ve redesigned your pages, and created new mobile apps and OTT channels. But when that big event hits and all eyes are on you, what will your audience see? Ads and great content, or errors and buffering? From ingestion to encoding and storage to distribution, New Relic provides end-to-end monitoring and analytics that connect your authors to your audience with lightning-fast page loads, and bufferless end-to-end video and audio performance. 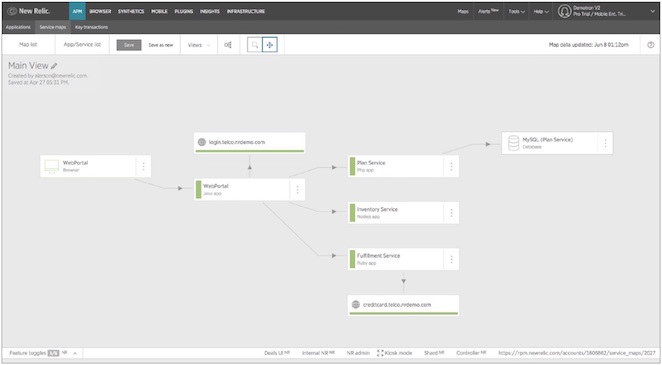 With the New Relic platform, you can quickly identify, isolate, and fix problems, helping improve customer experience, and, in turn, subscription and ad revenues. When your digital content is distributed across multiple systems and devices, it’s hard to move quickly. Consolidation is the answer, but going through that process of re-architecting to make use of the cloud and modern programming languages can be cumbersome. New Relic eases the pain, offering visibility into content-delivery performance pre-, during, and post-consolidation. With real-time visibility into what’s working and what’s not, New Relic helps shorten the time it takes to consolidate systems, which saves you money. Monitor apps written in Java, .NET, PHP, Node.js, Python, Ruby, and Go. 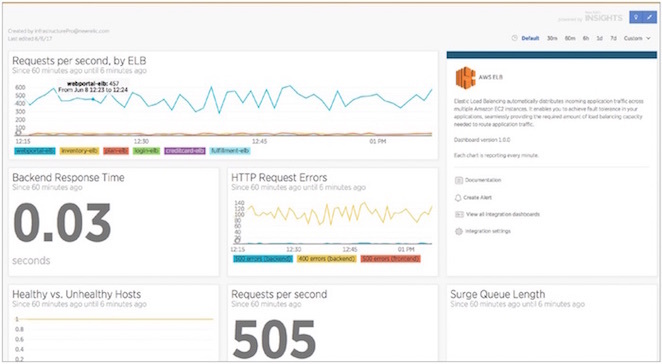 Create dynamic dashboards and alerting that track inventory and changes occurring in key AWS services. Visualize performance metrics for distributed applications and systems. You’ve adopted single-page apps to improve ad viewability, but now the same rigorous optimization that goes on in the backend code needs to be applied to the frontend as well. 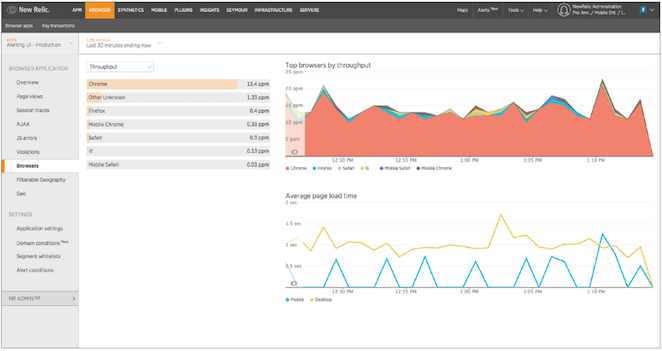 New Relic provides low-level, framework-agnostic instrumentation enabling deep visibility into both mobile interactions and page loads and route changes of single-page applications, so that everyone can see what’s happening right now and what they should focus on next. Quickly identify the top AJAX calls impacting page loads and route changes. Get a breakdown of slowest browsers, countries, or device types with just a click. Rapidly isolate data around performance issues with filtering by attribute. A hot viral story can cause your media-site traffic to spike at a moment’s notice. But latency issues and buffering videos could result in those page views (and their ad revenue!) going to a competitor instead. With full-stack visibility into customer experience, application, and infrastructure performance, you can prepare for both expected and unexpected traffic spikes and understand the potential customer experience implications in advance. Monitor, manage, and track the most important business transactions, independent of the overall application. Get visibility into your microservices architecture and understand how your distributed apps and services are performing. Gain insights that can help you maintain optimal performance, delight your audience, and boost ad revenue.